Due to fallout with Tony Stark Jim Rhodes has become a couch potato not interested in playing ceo to any big wigs, he wants to do something meaningful with his life. He is invited to a dinner party with renewed human rights activist Vincent Cetemayo who offers him a job in their organization which will do humanitarian work. He refuses and leaves, this cause him and his girlfriend to have a tiff. In Cetemayo’s nation of Imaya the ruling dictator brand him a traitor who will be brought to justice for sullying their name. They highjack Cetemayop on his way to the UN and take him hostage. The avengers and shield can’t intervene because of UN foreign policy. Rhodes decides to save him anyway. As War machine he enters their air space and is shot down. Cable leader of X-force arrives to take him back to the USA since he will only make things worse. 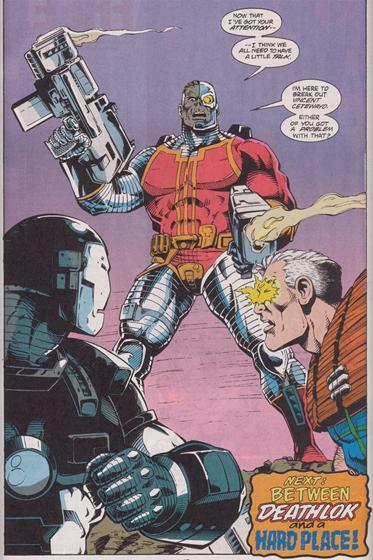 They fight until Deathlok arrives to also save cetemayo and kill any and everyone who stands in his way. 41 pages of pure story! You really cant skip through modern comics without a million adds taking up all the space and ½ the overall pages for even more money than these older comics. The foil cover still looks lovely to this day! 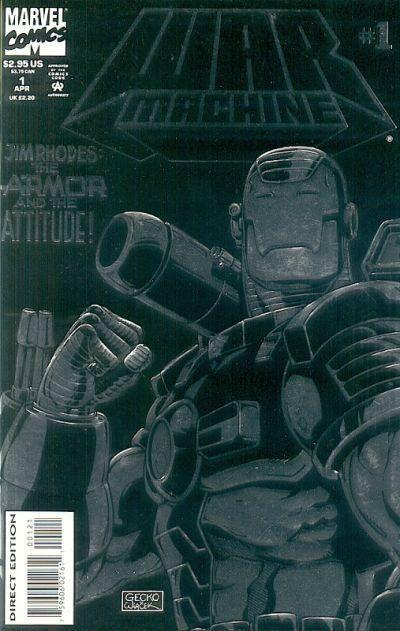 This issue gives us a bit of background on Rhodes and what was happening around this time with the iron man line of books. Continuity is followed in a great way, Cable steps in and we get reference to the 90’s battle between his team and Rhodes. 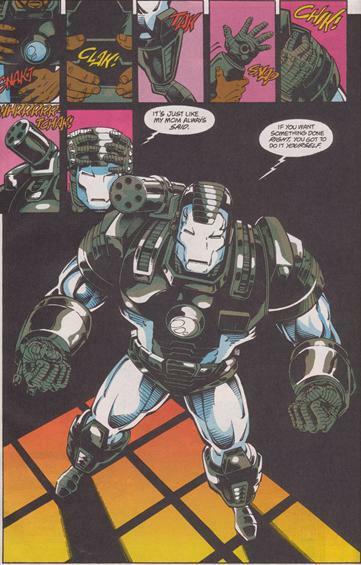 Deathlok’s inclusion was a plus since he’s always underused. Good action- the knockdown drag out fight between WM and Cable was good old fashion fights just for the hell of it. Rally don’t get why Cable would concern himself with what’s happening here. If you love computer enhanced pages this is not the comic for you.